Northern fur seals spend 80% of their lifetime foraging at sea. Females and young males appear uniformly black when wet. They appear gray or brown when dry except for the lighter colored throat and chest areas which may be seen when an animal is viewed from the front. Mature bulls are predominantly brownish-black and begin developing a lighter colored mane around six years of age. Females that have been ashore for a few days may appear brown due to staining of the fur by mud and excrement. There is no pattern of rings or spots on the pelage of fur seals. When observed at sea, fur seals appear very dark and are often seen porpoising (swimming with a series of arcing jumps out of the water, similar to many porpoises or dolphins) or resting on the surface with one or more of their long flippers curved above the water. Northern fur seals are part of the family Otariidae, called the eared seals. They have a visible ear flap and are able to slightly "walk" on land using their hind flippers. To keep warm in cold water, they have a dense fur coat with almost 350,000 hairs per square inch. Fully mature male northern fur seals weigh 450–600 pounds (200–275 kg) when they arrive at rookery areas in the late spring. As much as 25 percent of this weight may be lost during their stay on land. Mature females usually weigh 80–110 pounds (36–50 kg). 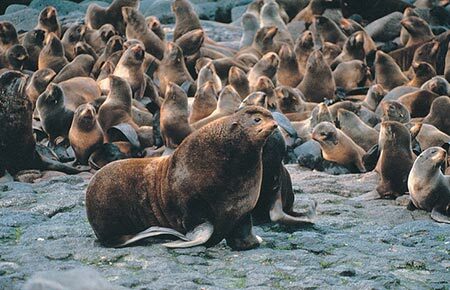 Alaska's Pribilof Islands are the breeding grounds for more than two-thirds of the world population of northern fur seals. Hundreds of thousands of these animals return there each summer to give birth and breed on land. Large males arrive first, establishing territories in May and early June which they aggressively defend for an average of 50 days. As many as 100 females may eventually collect within each of these territories, although numbers of 20–60 are more common. Pregnant females begin arriving in early to mid-June. Within 48 hours after arrival they give birth to a single 10–14 pound (4.5–6.4 kg) pup and then mate again within a week. Females nurse their pups for three to four months, making several week-long trips to sea to feed during this period. In order to attract mates and defend his territory, the male fur seal often makes a low, growling vocalization while out of the water, which can be heard for some distances. Males also produce underwater vocalizations including clicks and bleating sounds. Studies of vocal exhanges between mother-pup pairs found that northern fur seals can recognize each other's voices within a breeding season (after 3–4 weeks), between breeding seasons (after 1 year), and even between several seasons (after 4 years). Female fur seals mature at three to five years of age, and over 80 percent of those between ages eight and 13 are pregnant each year. Tagged females have lived for as long as 26 years, and one was found to still be reproductive at age 25. Males are sexually mature at five or six years but are usually not large enough or socially mature enough to enter the reproductive population until nine or 10 years old. Fur seals feed mainly at night and may dive to depths of 600 feet (180 m) in search of small schooling fish and squid. Seals eat a wide variety of prey; over 60 species have been identified from the contents of their stomachs. Food types change as the seals migrate, principally determined by the changing abundance of prey. Near the Pribilof Islands they feed on pollock, herring, capelin, and squid. Seals begin leaving the Pribilof Islands in November. By late December virtually no animals will be seen ashore. Unless sick or injured, northern fur seals will rarely touch land again until the following summer when the cycle begins anew. Throughout the intervening months they occur most frequently near the continental shelf edge, usually not closer than 10 miles (16 km) nor further than 100 miles (160 km) from shore. Females and immature males (ages 1–5 years) swim to the south and may be found from southeastern Alaska to California with some going as far as the California-Mexico border. Adult males do not undertake an equivalent migration. It is generally thought that nearly all of the older males winter in the Gulf of Alaska and southern Bering Sea. Northern fur seals can be found mainly in open ocean habitats, and spend 80% of their lifetime foraging at sea. When breeding, they aggregate on rocky shores or broad sandy beaches. The population estimate for the Eastern Pacific population of northern fur seals is approximately 720,000; the population has declined by >50% since the 1950s. Northern fur seals are listed as depleted under the Marine Mammal Protection Act. Fur seals were first described scientifically by Georg Wilhelm Steller in 1742. Commercial exploitation soon followed, and several million animals were harvested by Russians and later by Americans, resulting in severely reduced populations. In an attempt to stabilize the population and achieve maximum productivity, the governments of Japan, Great Britain (for Canada), Imperial Russia, and the United States met in 1911 to form the North Pacific Fur Seal Commission. This treaty prohibited pelagic (open ocean) seal hunting. Harvesting has been managed by international agreement ever since. Beginning in 1985, commercial harvesting of fur seals on the Pribilof Islands was terminated. Only those seals needed for subsistence purposes are now taken. 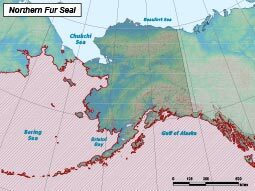 Annual subsistence harvests target young male seals between the ages of two and five. Other sources of direct mortality include killer whale predation and entanglement in marine debris, primarily nets, plastic packing bands, and line related to the fishing industry. Reproduce annually, from late June through July. Females give birth to a single pup, and mate again within a week.